Candlepower Incorporated, located in the Washington, D.C. suburb of Rockville Maryland, is a national and international distributor of light bulbs for the transportation industry. A BRIEF HISTORY - Candlepower was incorporated in Maryland in 1978 for the purpose of marketing "Candlepower Brand" specialty bulbs and headlights. Its founder Joel C. Gorick was the founder of several other successful Washington, DC based companies, among them: Universal Tire Corporation, Marchal America, Veloce Tire Corporation, and Universal Imports. He brought together a team of sales and marketing professionals to create a company free from the restraints and dictates of a single source manufacturer or distributor. To this end Candlepower now enjoys a working relationship with most of the major bulb manufacturers around the world and is presently supplied by factories in 12 countries. Candlepower's growth has been constant and steady with fiscal 2002 worldwide turnover at over $22,000,000. 1. AUTOMOBILE - Candlepower is actively involved in the marketing of bulbs for the automotive original equipment and aftermarket. Several lines of automobile bulbs including all foreign applications are offered. Candlepower is the exclusive North American distributor for Narva of Germany and several other European and Asian manufacturers. 2. MOTORCYCLE - Candlepower is the largest aftermarket supplier of motorcycle headlamps and bulbs in the USA. It markets a full range of replacement units for motorcycles including four unique patented models. Candlepower is also a leader in snowmobile and ATV bulbs. 3. 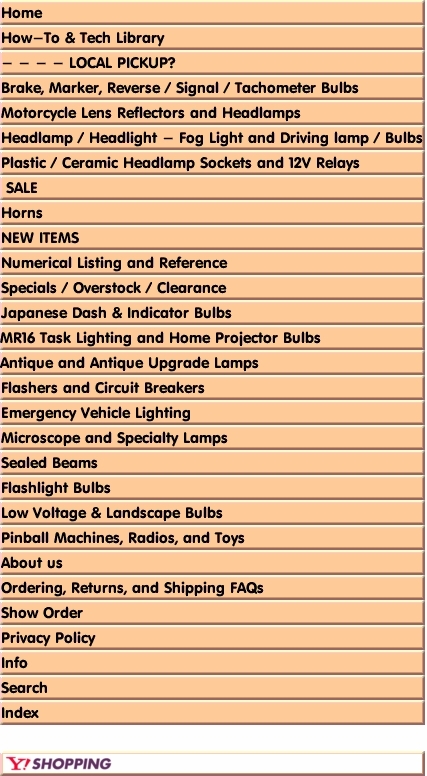 EQUIPMENT & SPECIALTY - Candlepower markets to very specialized areas such as police and emergency equipment, mining, aircraft, heavy equipment, off road, industrial equipment, etc. CONSULTING - Candlepower offers consulting services for the lamp industry in such diverse areas as product sourcing, mergers and acquisitions, and market survey. EXPORT - Candlepower exports to countries throughout the world, from factories in four continents. REPUTATION - Candlepower's long history of meeting every contract commitment and its track record of prompt payments to all suppliers, has given it an outstanding reputation among the bulb manufacturing community. Its expertise and experience in international banking, make it an ideal trading partner for overseas manufacturers. Decades "AAA1" D&B ratings assure smooth dealings and instant recognition among domestic trade suppliers. With over twenty years of exposure, the Candlepower Brand is well known to both consumers and resellers within its areas of specialization. Candlepower belongs to the Rockville, Maryland, and International Chambers of Commerce.